Laminitis is a severe and debilitating condition affecting the hooves of horses and cattle. It results from an inflammation and weakness in the laminae tissues of the hoof, causing adverse structural changes. In some cases, the changes progress so critically to ‘founder’ (advanced laminitis) that the condition is catastrophic for the horse, resulting in complete deterioration and even death. The laminae tissues are the foot’s main support system, bolstering the pedal or ‘coffin’ bone to the wall of the hoof. These tissues are the only thing preventing the horse’s body weight (roughly 500 kg) from driving the coffin bone down through the soft sole at standing or gallop. If laminitis occurs, the supportive tissues carrying out this task can fail, causing the coffin bone to detach from the hoof wall and shift. When this happens, the bone becomes unstable and is free to sink or rotate downwards through the sole of the foot, generating acute pain and discomfort. If the bone is no longer bonded to the hoof wall, the pull from the deep digital flexor tendon contributes significantly to the problem. This stage of ‘sinking’ is known as founder, which is always preceded by laminitis, although not all laminitic cases progress that far. In severe cases, the laminitic event sees the pedal bone sink so far that it penetrates the sole of the foot, something that very often leads to euthanasia of the animal. This is the most serious prognosis for a laminitic horse but is considered the fairest option as recovery from sole penetration is uncommon and treatments are both time-consuming and expensive. There are two types of laminitis: mechanical and systemic. Mechanical laminitis is usually the result of external factors such as a new or existing injury or being ridden or driven over hard surfaces. This happens when the pedal bone comes away from the hoof wall or the wall is lost owing to an external trauma affecting the front or hind feet. Systemic laminitis results from anatomical weakness of the foot, which separates the bone from the hoof wall and tears the surrounding laminae. When this occurs there is the potential for abscesses, and the condition can quickly progress to founder if left untreated. While it can happen in any of a horse’s hooves, it is most commonly seen in its front feet. To identify the extent of the problem, x-rays are usually the first stage of diagnosis. If the x-rays show inflammation of the laminae but no movement or displacement of the coffin bone then the condition is considered acute but treatable. Providing it is correctly managed, most horses will recover within several weeks and measures to prevent recurrence should be followed. If, however, the coffin bone has moved, either by rotation or sinking, the laminitis is considered chronic and much more jeopardising. Immediate treatment and hoof correction is necessary, as well as pain relief to lower blood pressure, reduce inflammation and improve blood flow to the feet. Therapeutic farriery is the term for measures taken to support a laminitic horse, including corrective trimming and fitted supports for the frog and shoe. So, how do I know if my horse has laminitis? Usually, a laminitic episode is easy to notice. Acute laminitis generally comes on within a few hours or days and is often the result of a relapse. Signs and symptoms depend on the severity of the laminitis and the pain your horse is experiencing. Most of the time, symptoms appear suddenly and may be similar to common symptoms of colic. A laminitic horse is likely to show reluctance to stand or move, resting back on its hind legs to relieve pressure on the front and placing heels down before toes when walking. It will appear lame when stepping on hard surfaces or turning corners or circles. It is also worth gently touching the frog of the foot for a digital pulse, as this will increase with laminitis. If the blood supply to the foot is severely compromised and/or destroyed, or bacterial infection has developed through loss of blood flow, the condition is considered to be serious for your horse and humane destruction is usually undertaken to alleviate suffering. Chronic laminitis lasts more than a week and is often more serious to treat. If you notice early symptoms of laminitis in your horse, it is essential you seek immediate veterinary advice. Laminitis is an emergency and should be treated as such. The earlier the condition is identified, the more effective the treatment and the less pain your equine has to go through. The potential for the episode to progress to founder is also reduced if your horse’s laminitis is caught early. On first observing symptoms, remove your horse from the paddock or field and place in a stable with deep bedding (shavings or sand being the best option). Refrain from putting food in the stable but ensure plenty of water is available. Encouraging your horse to lie down until the vet arrives is sensible, as this will remove pressure from the feet and allow the vet to properly examine them. Depending on the diagnosis, various treatments are available to manage and treat the laminitis your horse is experiencing. These range from anti-inflammatory pain relief medications, Cryotherapy (placing hooves in ice-cold water) and extensive nursing, to immediate surgical interventions. Because of the severity of laminitis, even after treatment and eventual recovery, a horse is likely to experience minor discomfort and/or complications for the rest of its life. Complications and relapses are common, especially if only one foot was affected the first time round. Placing added weight on an unaffected foot because of the pain being felt in another (through lameness, injury or previous laminitis) can have a negative outcome in the long-run, with laminitis taking hold in the limb that was originally healthy (contralateral limb laminitis). Foot abscesses are also more common in horses that have suffered from laminitis in the past, which can develop into severe bacterial infections. Abnormal hoof growth is another cause for concern in horses recovering from chronic laminitis. There is some truth in this; excessive grain or grass intake (carbohydrate and nigrogen overload), especially grass that is lush around springtime, can cause digestive upsets which can, in turn, onset laminitis. The digestive tract and endocrine system are strongly linked to hoof health because any internal inflammation brought about by increased lactic acid permeating the gut can progress to the feet. The hoof laminae are particularly vulnerable to diet-related inflammation as there is no room for tissue to swell inside the hoof wall. But obesity is by no means the only cause. Other contributors to laminitis include colic, with endotoxins being present in the bloodstream (these trigger immune responses in most animals), as well as existing infections that have not been eradicated. Less common causes range from reactions to drugs, poor blood circulation, restricted forage, injury to the hoof from an external influence, riding on hard surfaces causing concussion to the foot, and stress from prolonged travel in a horse box. Improper trimming of the hooves over a period of time can also lead to laminitis, although this is rare. Sometimes, there is just no rhyme or reason for your horse's laminitis and it can be difficult knowing how to avoid a future recurrence. There are, however, some tips on laminitis prevention that should be followed, especially with horses that have already experienced a laminitic episode. Feeding a high fibre diet consisting of hay and mature grass, as well as a mineral and vitamin supplement (calcium is very good for hoof health), is the best option for horses year-round, avoiding cereals, brans and coarse mixes. Using electric fences to separate horses from lush or bare pastures is also beneficial, as is keeping horses off of frosted grass. Helping your horse maintain a healthy weight is part of responsible ownership and nothing is more important in the fight against laminitis than weight management. Regular hoof trimming and specialist shoeing will aid your horse enormously by balancing weight distribution, and being aware of how and where you work your equine will contribute to the on-going condition of its feet. 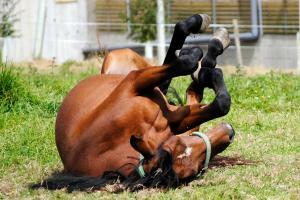 In summer and winter months when the ground is hard, over-working your horse can cause concussion to the hooves. Driving your animal over concrete is very detrimental and appropriate shoeing is a must, providing support where your horse needs it most. Maintaining good hoof care and hygiene, and being aware of changes (both physical and behavioural), will stand you in the best stead of noticing symptoms early and seeking help. Put simply, awareness is probably the best and only method of defence against this devastating condition. Ensuring your horse is healthy through correct diet, exercise and grooming is vital for prevention, although laminitis can strike at any time and should always be treated as a matter of urgency. To help prevent and manage laminitis, VioVet stocks a range of tailored supplements and hoof care treatments, as well as an extensive choice of bandages and poultices for strapping damaged feet. If you have any further information about laminitis or any past experiences to share with other readers, please post your comments below or email me directly: [email protected] We hope this blog has been useful.